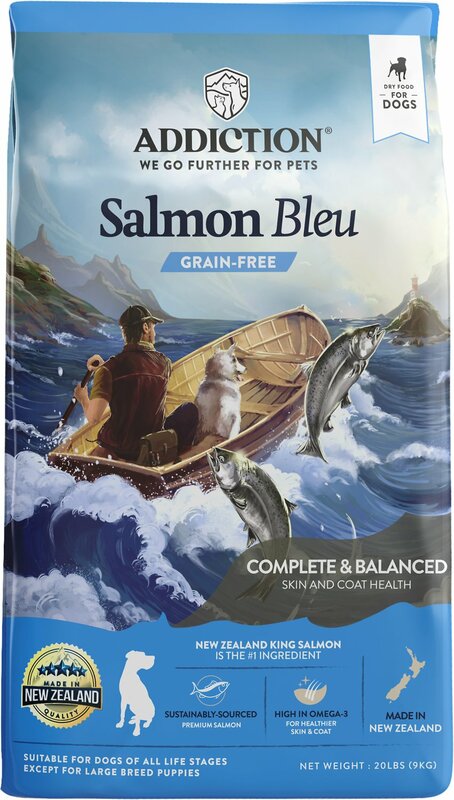 Your dog will go wild for the Addiction Grain-Free Salmon Bleu Dry Dog Food. Featuring smoked Pacific salmon from the bluest oceans, this recipe is a hypoallergenic diet with an optimal balance of essential nutrients. 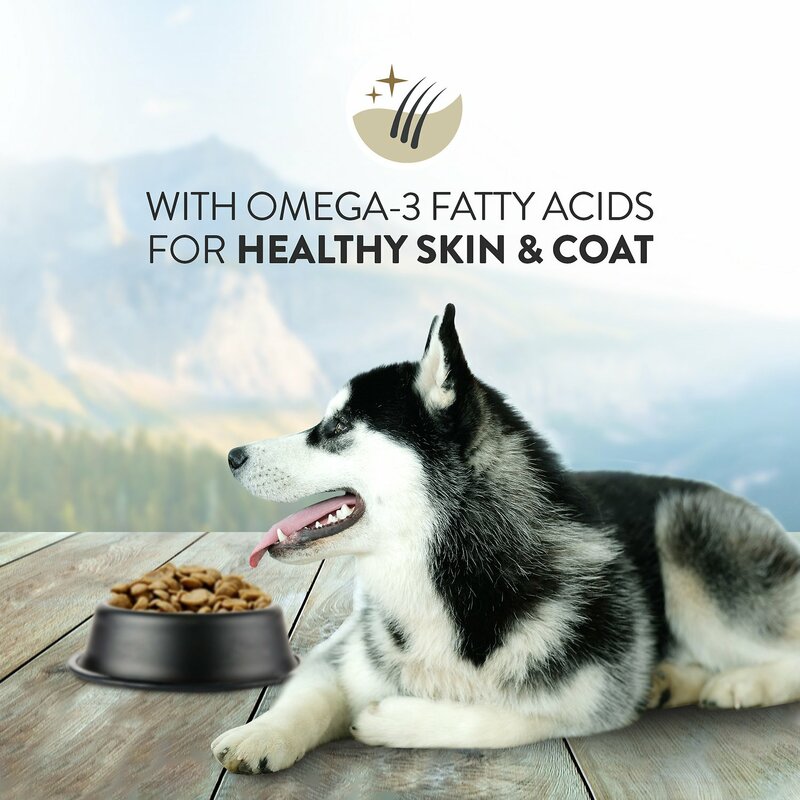 This includes a high level of omega 3 fatty acids, so it’s just what the chef ordered for a healthy skin and coat. It’s also made with cranberries and blueberries that are high in antioxidants—but all your dog will care about is the delicious, gourmet flavor. Made with the finest Pacific smoked salmon from the bluest oceans for a delicious flavor. Healthy Blend of Sun-Kissed Berries providing an abundance of antioxidants, phytochemicals, and flavonoids. Recommended for a healthy skin and coat due to the omega 3 fatty acids in this diet. All-natural and hypoallergenic with no added corn, fillers or wheat or artificial colors or flavoring. Premium, gourmet diet includes vitamins and minerals for complete nutrition at all life stages. Mix increasing amounts of Addiction's Salmon Bleu with decreasing amounts of the old food over a 7 day period. When supplementing with canned food, decrease the amount of dry food to avoid overfeeding. 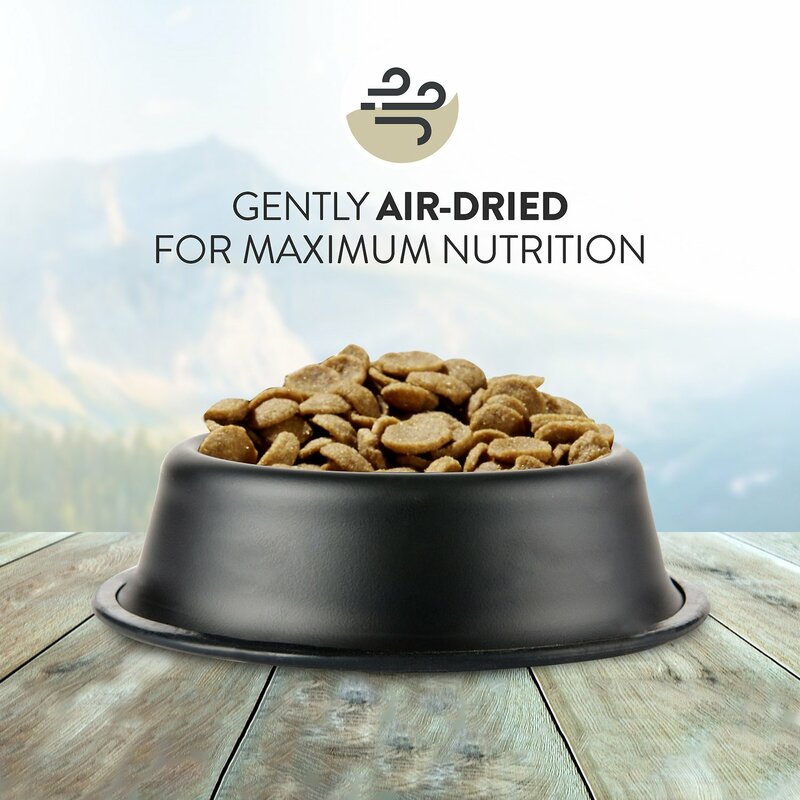 Pet food of our dreams? My Akita Inu LOVES it!! My dog has a lot of tummy sensitivities and so far this food agrees with him. It’s very difficult to find a dry food that my boy isn’t allergic to and this food is working well. I’m only on the first big bag but he has been completely switched over now with no upsets and we will be ordering more in a couple of days. Even the picky one likes it. I have 3 small dogs, A Shih Tzu, A Bichon, and A Yorkie. My Bichon had bladder stone surgery and has to eat special food, but I let her have this as a treat. The Shih Tzu is a very very picky eater and I am so glad to find a food that he doesn't hesitate to eat. I feel good feeding them this food and Chewy price and delivery is great. We tried the other flavors of Addiction, but this is the one they prefer so I will stick with it as long as they keep gobbling it up. My dogs have very sensitive stomachs, and many food allergies. They have been getting sick a lot lately. After some research, I discovered the supposed to be healthy dog food I was feeding them changed. My dogs Absolutely love the addiction dog food and they are no longer getting mysteriously sick. I received a list of dog food from my groomer that were researched to be healthy and trustworthy. Addiction was on the list. I love that I ordered the dog food and it arrived the next day on my front porch. I no longer have to make a special trip to the pet store. I will be ordering this dog food again! I found a keeper! I have a Yorkie that was liberated 2 years ago from a puppy mill at age 5. As you might imagine she was a mess. Not only did she lose 17 teeth her skin and fur was horrible. The salmon helps the skin, it doesn't flare up her food allergies, and the kibble is thin enough for her to chew it. As usual, Chewy has the best price and service. Through no fault of Chewy's, the delivery truck left this and 4 boxes of cat litter at the end of my drive in the pouring rain, ruining the cardboard boxed litter. Chewy sent me more litter at their own cost. Our pup can't get enough! 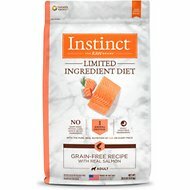 Our mini-Aussie absolutely loves this dog food! We got it first as a sample and used it as a training treat-- she went CRAZY for it. I could smell the freshness of the meat and feel the quality of the food when I was giving it to her. It made me happy that my pup really enjoyed this, especially because Addiction Pet Foods only uses top notch ingredients, so I know she's getting great food. Will definitely be getting this for her again!!! 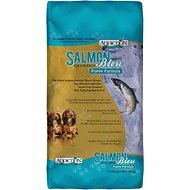 Great choice for dogs with sensitivities! We had our dogs tested for allergies. Our vet gave us a list of the companies who make a product which would be a best fit for our dogs. We ordered this one because it only had 2 ingredients they were sensitive to, kelp and peas. One of our Boxers would not eat until many hours after the food was placed in his bowl. The day this food arrived from Chewy and he got it in his bowl, he ate it instantly. They love it and we use it as treats as well! Upon opening this small bag of expensive dog food which I was suggested to try by a Chewy representative over the phone, there was a terrible rancid odor similar to when liquid cooking oil goes bad in your cabinet!! Expiration date says October 2016!! So, I will not be feeding this to my 23 week old puppy! I will be calling for a refund. I don't think many are aware of the high quality of Addiction foods. I'm a breeder & have fed this to my puppies & dogs for years. Direct lines of communication with the company are outstanding with knowledgeable customer representatives. I've never had any health issues with my dobermanns, they're active & lively, skin & coats are beautiful. 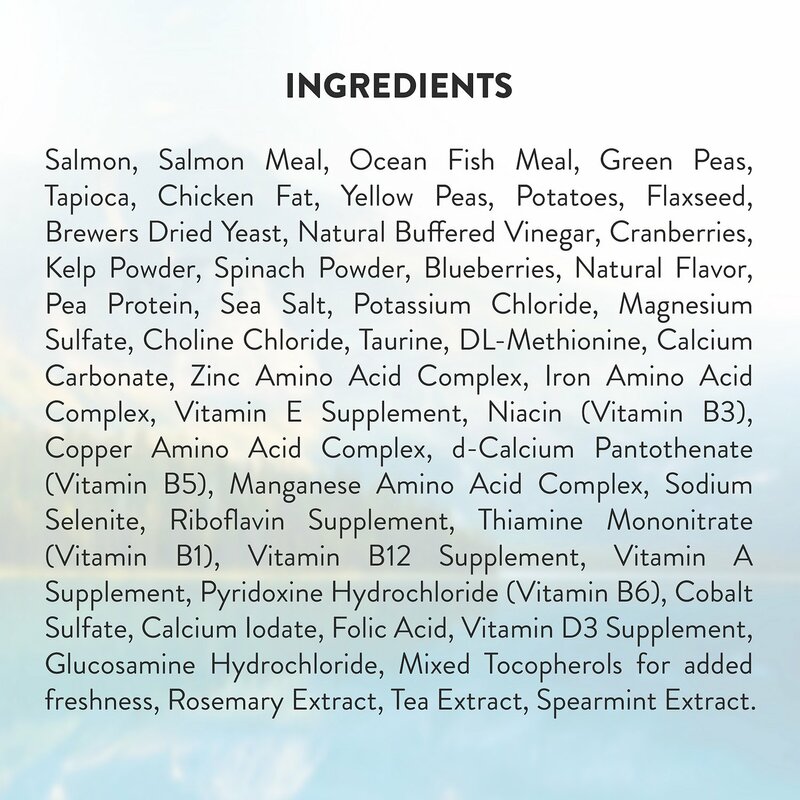 Unlike other foods, no supplements are required when feeding. Bag packages arrive with cryovav seal to assure freshness. I'll never use any other brand.